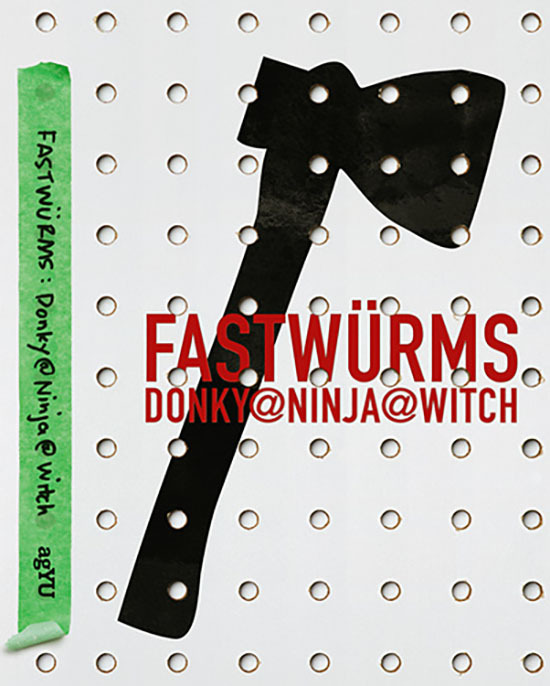 Exhibition monograph for DONKY@NINJA@WITCH, an exhibition by FASTWÜRMS that was held the fall of 2007 at the AGYU. Beautifully designed by Lisa Kiss, the catalogue includes essays on the work of FASTWÜRMS by Emelie Chhangur, Sally McKay, and Jon Davies, an introduction by Philip Monk, and a love letter from Andrew Harwood. Copiously illustrated, this hardcover book covers the inception of the work, the creation of the exhibition, and the implications of the FASTWÜRMS corpus for good measure.